Today’s (one of) the day(s). For those of you who haven’t followed Brexit, the British Parliament will vote this evening on whether to accept the deal Prime Minister Theresa May negotiated with the European Union…or not. And if not, well, the government now only has three—instead of the original 21—days to figure out a Plan B. Of course this vote is only happening today because the government punted back in December when it was clear they were going to suffer a substantial loss. And back then, the BBC prepared this article about Brexit, where it was and where it was going. Funny thing is, after a month, not much has changed. The screenshot below is of the process. As I noted above, the most critical change is that the government no longer has 21 business days to figure out what’s next. So instead of, to use the American football phrase, running out the clock, May will have to come up with something and present it to Parliament before 29 March, the day the UK leaves by statute. 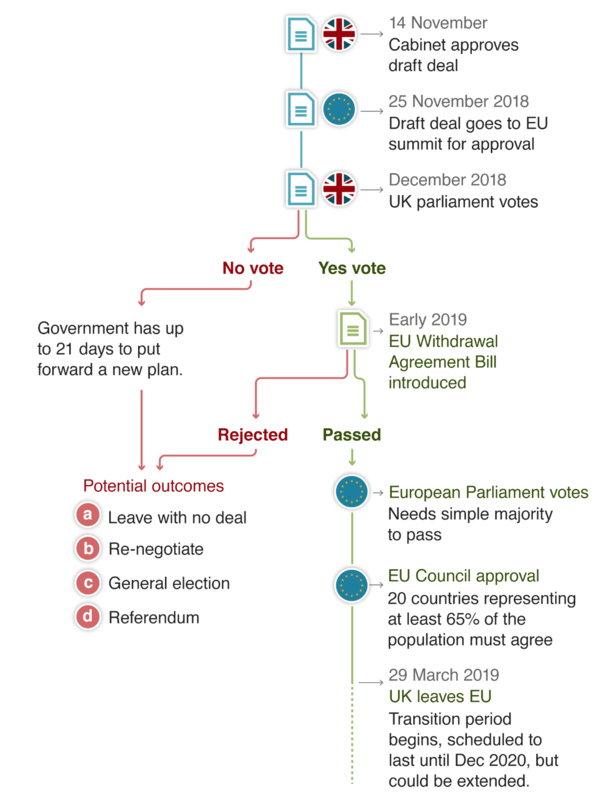 I think the thing missing from the graphic is the chaos that happens if the deal is rejected. And while that may have been far from clearly the most obvious result two and a half years ago, it is now. And Parliament is scheduled to start voting around 19.00 GMT, or 14.00 EST for those of us on the East Coast or 13.00 CST for those of you in the Midwest. Next Next post: What’s Next, Brexit?